When I heard that the Wii was getting some retro Mario treatment after reading the Super Mario Bros Wii preview from the E3 announcement last year, I was rather ecstatic. 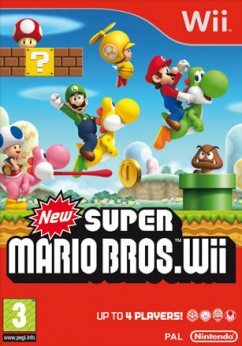 I should note that my first encounter with Mario was on the original GameBoy, so despite my excitement I wasn’t sure whether a 2D-based >New Super Mario Bros Wii game would work well on a newer console, especially with titles such as Mario Galaxy delivering a 3D update to the old franchise. As with all Mario games, the objective is to save Princess Peach, who is kidnapped at her birthday party (big surprise there) and need Mario to save her. You navigate around the game, which is broken up into worlds and sub-worlds, by traveling to each sub-world in the kingdom. To control Mario (and others) on your adventures through the kingdom, you hold the Wiimote horizontally, using the “1” and “2” buttons along with the d-pad for navigating your way around the course. A new feature to the game is the introduction of power-ups to help you clear the levels and collect all the stars on offer. These vary from flying propellor hats to get to those hard to reach areas, and fire and ice attacks to take out the more challenging opponents you may meet along the way. Old school gamers will feel a familiarity with the gameplay, which is essentially unchanged since the original NES title was released apart from superior graphics. The 2D gameplay works with a scrolling screen, as was the case with previous versions. A big change from previous versions of the game is the ability to play multiplayer, allowing four people to tackle a course at the same time. This can come in handy if you’re stuck and need a friend to help you get past a course, and makes the worlds more fun to get through. Also, when playing multiplayer you can use all of your lives before being eliminated from the level – when you die, you can float to another player in a bubble, who ‘pops’ you allowing you to continue the course. Oh and did I mention that in some worlds, you can ride on Yoshi’s back? Although this feature is limited, it offers various advantages, including the ability to eat those nasty plants that are trying to eat you all the time! If you want to quit the game without completing a world (which you won’t want to do) you can choose to ‘Quick Save’ which is a nice feature, as you don’t have to complete an entire world and have the game saved automatically. For all you retro gamers out there, you’ll be glad to know that the music score is still as good as it was all those years ago, and you’ll struggle getting it out of your head after a long gaming session! You’ll also be glad to know that the levels are original and different than previous games, so you’ll face new challenges. The levels get harder as you progress through the world’s, but I thoroughly recommend New Super Mario Bros Wii to any Mario fan – the 2D platform scrolling game is well and truly back for modern multiplayer Mario action, and worth every penny!